It’s Breast Cancer Awareness Month, and our team at Riddle Heating & Air has found a better way to show our support for the thousands of women who are diagnosed with breast cancer, than by just going PINK. 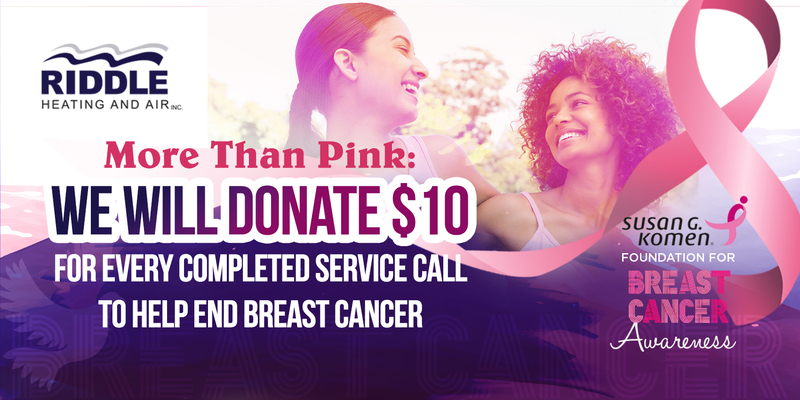 For the entire month of October, Riddle Heating & Air will be donating a portion of our sale to the Susan G. Komen Foundation as active participation to the Breast Cancer Awareness Month. We will donate $10 for every service call we complete and collect from. Someone dear to you somehow has been touched by this dreadful disease! Whether they are breast cancer survivors or undergoing treatment, they deserve to live a normal life like anyone of us. So why not start making an impactful move today, if not for the people you care, at least for those who want to live longer? Let us put women’s health in our priority this month, the same as we put your home comfort on top of our list. We encourage you to do your part and schedule your heating tune-up, maintenance, repair, or installation with us this month. It is your help that makes this life-saving effort possible! Call us today to set up your appointment and let’s start making a difference together.